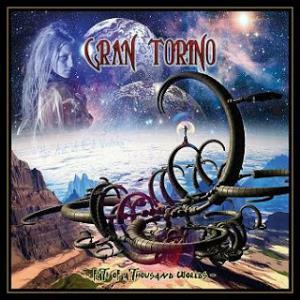 Gran Torino are an Italian instrumental progressive rock band playing music strongly based on seventies prog rock with a major role for piano and keyboards. In 2011 the band recorded their debut album GrantorinoProg. At the time the band consisted of keyboard and piano player Alessio Pieri, guitarist Cristiano Pallaoro, bass player Gian Maria Roveda and drummer Fabrizio Visentini Visas. In 2013 the band finished their second album called Fate Of A Thousand Worlds. In the meantime guitarist Pallaoro had been replaced by Leonardo Freggi, who now plays the guitar on the band's new album. On the debut album the band's music was influenced by Kansas, Genesis and partly Spock's Beard. The music was strongly dominated by keyboards and piano with progressive guitar lines that seemed to have trouble to keep up with the standard of the other musicians. On the new album Leonardo Freggi plays the six strings and therefore the style has slightly shifted. Freggi has a more jazz and fusion approach sometimes with a metal edge. His solos are flashier and his riffs bigger. It's needless to say that the other musicians were challenged to create strong and powerful compositions. On Fate Of A Thousand Worlds keyboards and piano are still prominent in the overall sound of Gran Torino, but Freggi's guitars provide the songs to be more balanced. In the first song Child Of The Stars you'll hear a Kansas-like keyboard line slightly blended with jazz-rock and fusion elements. The guitar solos have a rich sound together with the keyboards, which create a perfect balance without one being overruled by the other. In a way the music sounds as a light version of the instrumental compositions recorded by Dream Theater. Absolute Time contains fusion and influences of Planet X, which makes this one interesting to listen to. It doesn't sound as furious as Planet X, but that isn't the intention of the band since the progressive elements dominate. A beautiful song that grows on you is The Battle Of Velasquez; the wonderful piano melody seems to be chased by a kind of Planet X influenced guitar sound. It gives this piece a lot of positive energy and it's an absolute highlight as far as I'm concerned. In Dead Suns the prog rock piano and the fascinating guitar play return. Although the keyboards and the guitars require a lot of attention, the mixture of the bass and the drum sound is really outstanding and has to be mentioned here. Most of the songs have been composed with a fine piano sound in the background. I love the tormented piano sound during this composition and I'm really amazed how much Gran Torino have grown music wise on this second album. Empty Soul tends again in the direction of Planet X with influences of Derek Sherinian mixed with flute sounds, but the intensity of the guitar play comes close to the heavy chops of Tony MacAlpine or Greg Howe. Sometimes even the sound of Allan Holdsworth can be heard in the guitar playing. Arìda contains a strong piano solo by Alessio Pieri that shows the skills of this fine musician. A bit more theatrical is The Short Dream, but just like the other songs, the balance between the intense keyboards and the forceful guitars is perfect. Magnificent keyboard sounds duelling with a fabulous guitar solo is the main attraction on End Of A Planet. Eventually this composition has become my personal favourite on the album that ends with the title track, a stunning example of prog rock and virtuosity. The result is, as I mentioned before, a great light version of the music of Planet X.
Gran Torino have made a lot of progression compared to their debut. With the replacement of the guitarist they moved the bar up by a few notches and forced themselves to create more challenging compositions shifting toward a heavier prog rock or prog metal style. With an album like Fate Of A Thousand Worlds Gran Torino may be very proud of themselves! They can face the future with confidence.